It’s something we at Brafton say all the time. It’s the first step to a successful content marketing strategy. But what does knowing your audience really mean? For us, it means understanding what our readers are searching for and, more importantly, being there with answers to their questions. So, to practice what we preach, we decided to examine the personas of our most engaged readers. We asked our newsletter subscribers what they are most interested in learning from us. You can never have too much material around the topic of content creation. The majority of our respondents (67 percent) listed “content creation” as the area they want more resources on and would like to learn more about. 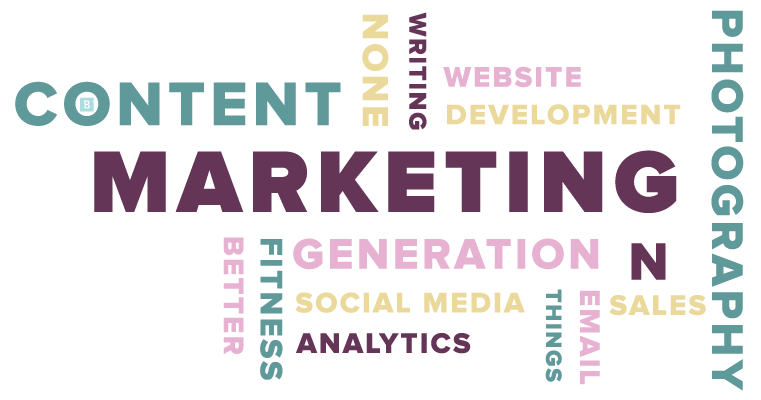 The best way to learn about content marketing is through blog articles. Most of our respondents (68 percent) noted that they like to learn about content marketing via blogs. A close second (at 62 percent) preferred eBooks, white papers and other downloadable assets. Email marketing is alive and well and the expertise is high within our readership. 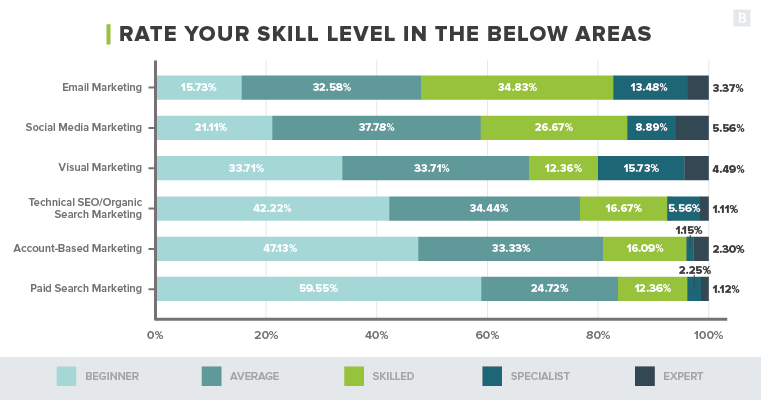 52 percent of our respondents rated themselves as above-average in the field of email marketing (selecting either Skilled, Specialist or Expert as their skill level). There is a knowledge gap with paid search marketing. The majority of our respondents (84 percent) consider themselves either beginners or average in the field of paid search. This represents a significant knowledge gap within our audience. Photography (in and outside of marketing) is a hot topic. When our respondents were asked what other topics/hobbies they like to learn about outside of content marketing, “photography” was the 3rd most frequently mentioned response (after “marketing” and “content”). Our respondents were asked to select all areas that apply in this part of the survey. 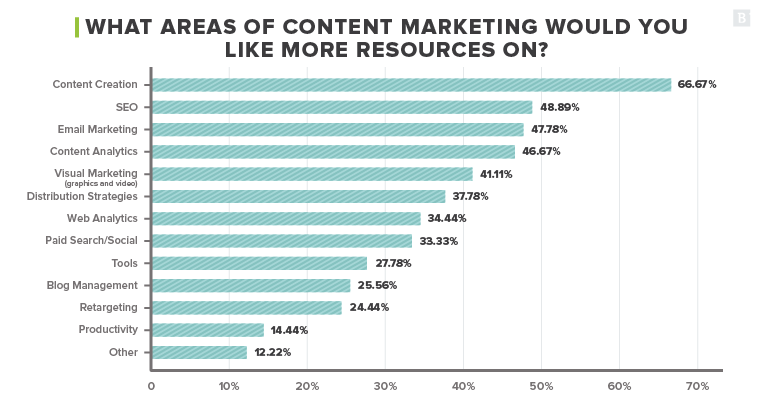 We were interested to see what types of content marketing our readers might be struggling with or in need of more resources on. As noted above, most respondents (67 percent) are looking for more resources and guidance around content creation. This fact doesn’t really surprise us much. With content marketing, the content ideation struggle is real. It’s something we grapple with every single day. It’s a non-stop exercise in finding new and compelling ways to tell your story. As an added benefit, these responses have provided us with a very actionable roadmap for our own content ideation and planning in the months to come. So, thank you to those who contributed…know that you helped a content marketer in need today. 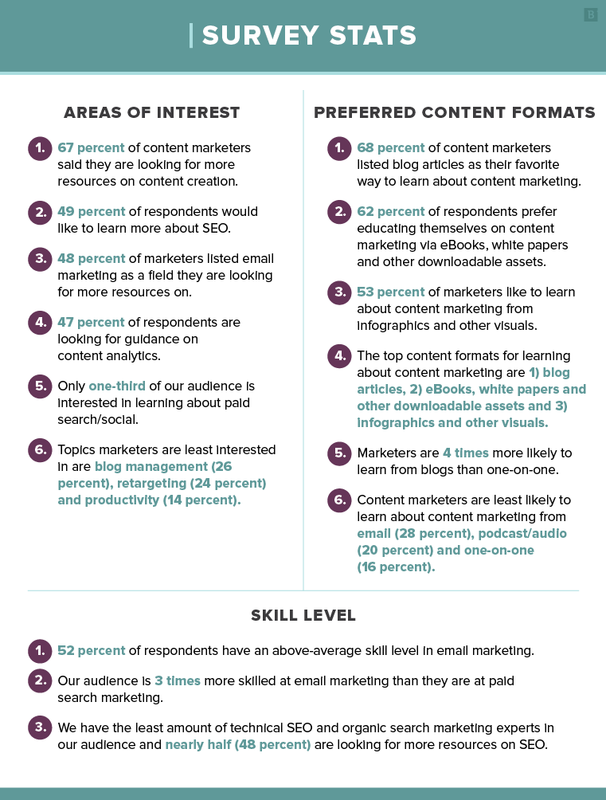 After content creation, the areas requiring more resources are SEO (49 percent), email marketing (48 percent) and content analytics (47 percent), respectively. These also happen to be some of the topics we cover most frequently on the blog. This shows just how big the appetite here is for new ideas, recommendations and perspectives in these fields. You asked, and we’ll deliver. Some of the lowest-scoring areas were blog management (26 percent), retargeting (24 percent) and productivity (14 percent), which helps to solidify our understanding of our audience’s main focus. This was another question where we asked respondents to select all answers that applied. We assumed our readers consume content in various formats, times and places, but we wanted to know which was their preferred format for learning about content marketing specifically. The majority of respondents (68 percent) said their favorite way to learn about content marketing was through blog articles. This doesn’t come as much of a surprise because it’s how the majority of our polled audience actually receives our content (they read articles on our blog and/or they get a recap of these blog articles direct to their inbox in our weekly newsletter). After blogs, 62 percent of respondents prefer educating themselves on content marketing via eBooks, white papers and other downloadable assets. Fifty-three percent of marketers like to learn about content marketing from infographics and other visuals. With this data, we can now make a more informed approach in not only the topics we cover but the format in which we deliver them. And remember, this is all in an effort to provide the best content possible to our audience. In our third question set, we asked respondents to rate their skill level in various areas of marketing (email marketing, social media marketing, visual marketing, technical SEO, ABM and paid search marketing) on a scale from beginner to expert. We wanted to get an understanding of our audience’s current range of expertise across these aspects of content marketing. The results would help us shape the way we cover relevant topics and whether or not we need to add more beginner-level material or if we can safely dive into the finer details without turning readers away. In the chart above, we’ve organized the fields based on skill to get a clear view of where the proficiency of our audience resides. As you can see, more than half of our respondents (52 percent) consider themselves to have above-average knowledge of email marketing. Additionally, visual marketing had the largest amount of respondents (16 percent) that see themselves as specialists. Paired with the knowledge that a significant proportion of our respondents are hungry for more content around email marketing and visual marketing, we now know we can create more in-depth content in those areas. On the other hand, from the above responses, we can see that the majority of our respondents (84 percent) consider themselves either beginners or average in the field of paid search. We now know, then, that there is a significant knowledge gap with our readers on this topic. There is also only a moderate level of interest in receiving more resources around this topic, as 33 percent of respondents noted in the first question. So, if we’re going to cover paid search, we know we will need to start with beginner-level guides and build from there. Again, knowing the skill level of our audience and their preferences on subject matter gives us a very clear idea of how to approach these topics in forthcoming content. The purpose of this question was two-fold. One, we wanted to better understand more about what makes our readers tick. What do they prefer to do or learn about when they’re not consuming material around content marketing? Yes, we’re all a little (read: a lot) obsessed with content marketing, but we’re also humans with varied interests and hobbies. Two, and perhaps more self-servingly, we were fishing for new ways to approach the topic we know and love so much: content marketing. If there was an opportunity to view content marketing/email marketing/visual marketing, etc. through a different lens, we wanted to know about it. As you might imagine, the answers varied. In analyzing the responses, we looked for throughlines and similarities, to arrive at a bit a of thematic direction that would also be actionable for our content-ideation process. What we found was that one of the most common interests was photography, a number of the open-ended responses included the word “photography.” It was the 3rd most frequently mentioned response (after “marketing,” and “content”). While we certainly cover a lot of ground around visual content on the blog, most of the focus goes toward graphic design and illustration. We admittedly haven’t created a lot of educational content around using photography in marketing or how powerful that aspect of visual design can really be. The most we’ve done is scoff at stock photography, without offering our readers adequate guidance on how to actually work with this visual asset. Going back to the interests and skill levels of our audience from questions 1 and 3, we know that 41 percent of respondents are looking for more guidance on visual marketing and 66 percent of them have an average and above skill level. 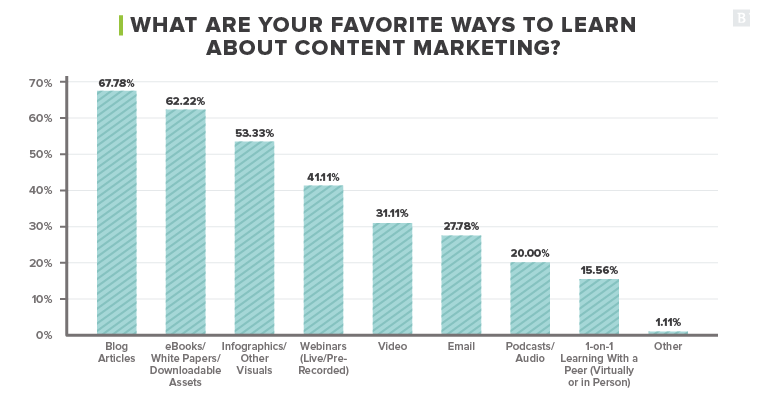 From question 2, we also know 53 percent prefer to learn about content marketing in a visual way. This type of information is invaluable to us as content providers. This one bit of info has the potential to fuel an endless amount of topics just around photography and content marketing. The above is just one example of how we will be able to create content that our audience craves, content that is fine-tuned to their exact preferences and skill levels. This is a ton of valuable data from just a simple 4-part poll of our audience. Two minutes of their time gave us plenty of material to work with in the months to come. This type of question set isn’t necessarily new or novel or extremely exciting, but it was absolutely necessary to our process and responsibility as educators in this space. Just imagine what a similar survey to your audience will yield. …but are we talking about an African or European Swallow?! Okay, Blue Apron. We’re on it. Did your airplane seat get taken by a service animal? Where’s the beef?! I think this falls pretty far outside our area of expertise…maybe a topic for the podcast, though? To open up a line of communication between our blog readers and our content creators. To better understand what our audience is struggling with and/or striving to improve on in their day-to-day. To combine what we learned from goals 1 and 2 to provide even better (more relevant, higher quality) content for you this year. We designed and distributed a 4-question online survey to our newsletter subscribers in February 2019 via email. We received a total of 90 valid responses over the course of two weeks.